I was shocked to discover there’s only one credited screenwriter for “2 Guns” (Blake Masters, based on graphic novels by Steven Grant). Considering the convolution level of the plot, unnecessary twists and non-revelatory revelations, I had imagined the work being passed around and around like a game. One person can take the first ten pages, the next guy or gal the next ten, and so on. The catch: you can’t read what the person before you wrote. Undercover DEA agent Bobby Trench (Denzel Washington) and undercover Navy officer Michael Stigman (Mark Wahlberg) are each attempting to infiltrate a drug cartel for their respective associations. By the way, the Navy has undercover intelligence officers? Anyway, each member of the duo does not know the true identity of the other, a bank robbery involving what they think is drug money goes bad, and double crosses and suspected double crosses with multiple characters and government agencies ensue. Don’t worry if you can’t keep up, it doesn’t really matter. Of course a film like this ends with all the players inexplicably winding up in the same location and shooting each other. Some wind up dead, some do not. What happens along the way you just have to accept. Especially when so many characters seem to appear exactly when and where they need to be to move the plot forward – showing up at will from secluded Mexico ranches to Naval bases, apartments, garages and anywhere else. Problem is, the film wastes a lot of potential fun with two primary antagonists: Edward James Almos’s drug kingpin Papi and Bill Paxton’s mysterious brute who’s attempting to track down his $43 million. Each is mostly a slave to their narrative contrivances and isn’t really allowed to chew the scenery. Thrown into the mix are Paula Patton’s potentially scheming, but maybe not DEA agent and former flame of Trench’s. And also James Marsden as a most likely scheming Naval commander. And also Fred Ward pops up in a meaningless scene as an Admiral. This film has a pretty acute case of “and also” syndrome. 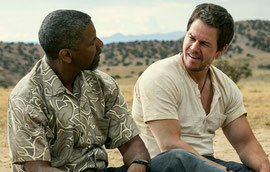 What makes “2 Guns” work in stretches is the chemistry between its 2 Leads. Washington and Wahlberg work well as the mismatched team out to…clear their names?...I guess? You never get a sense that Washington’s character has real support from the DEA and Wahlberg certainly doesn’t have support from the Navy. Whatever their motivations, they are an entertaining enough pair to watch. Even when they start 2 separate kitchen fires. At the climax when explosions and bullets solve everything, Trench has re-inserted a pair of gold teeth he used while undercover. With bad guys bested, he pulls them out declaring he “always hated these things.” But with his cover long blown there was no reason for him to put them in, anyway. Kind of like 90% of whatever is thrown into this film. But it's an acceptable enough riff on well-traveled material.